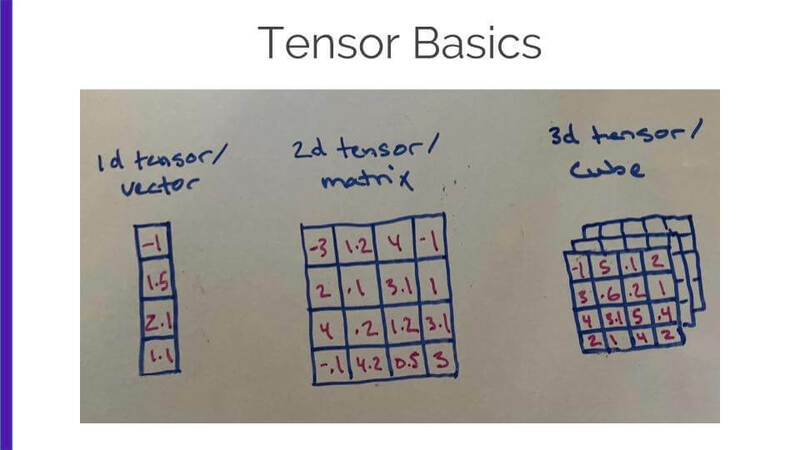 Anyone who is interested in deep learning has likely gotten their hands dirty at some point playing around with Tensorflow, Google's open source deep learning framework. 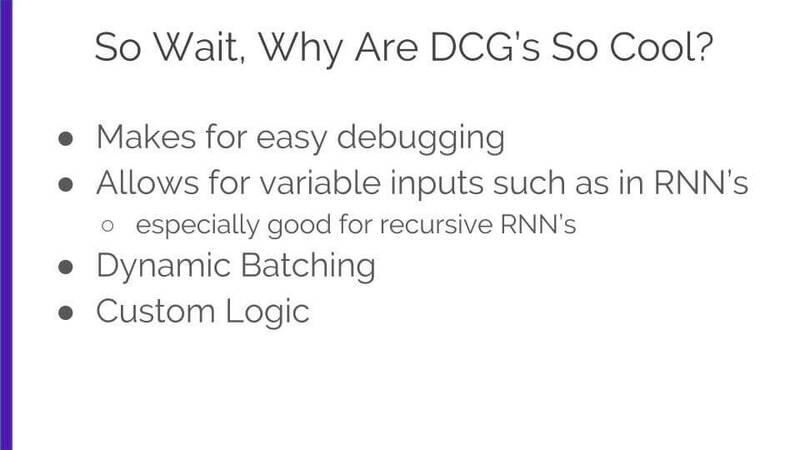 Tensorflow has a lot of benefits like wide-scale adoption, deployment on mobile, and support for distributed computing, but it also has a somewhat challenging learning curve, and is difficult to debug. It also doesn't support variable input lengths and shapes due to its static graph architecture unless you use external packages. 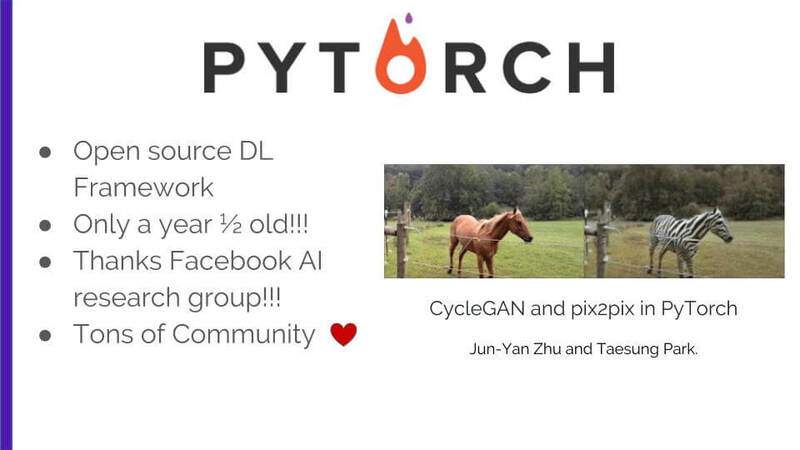 PyTorch is a new deep learning framework that solves a lot of those problems. 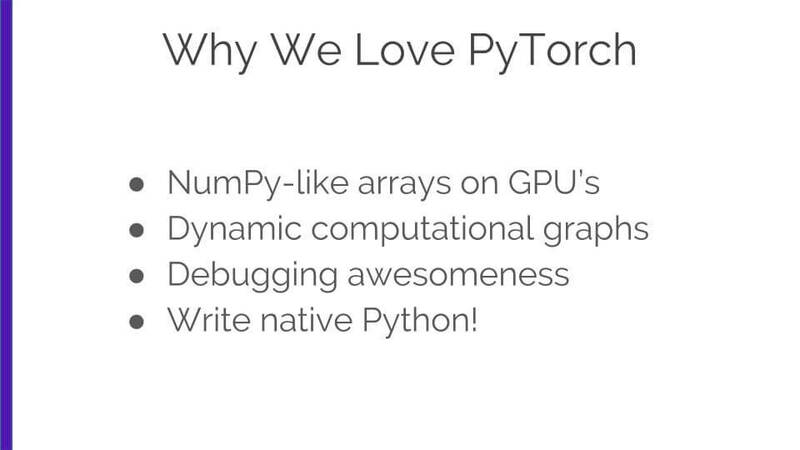 This talk will objectively look at PyTorch and why it might be the best fit for your deep learning use case. 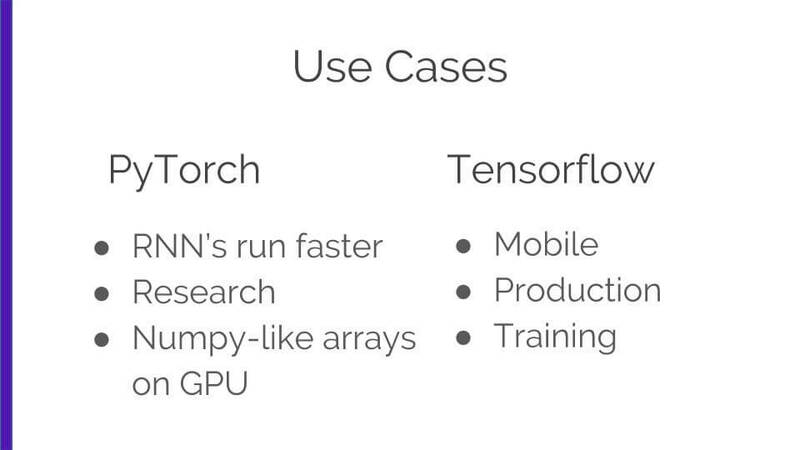 We'll look at use cases that will showcase why you might want consider using Tensorflow instead. First let's define some terms. 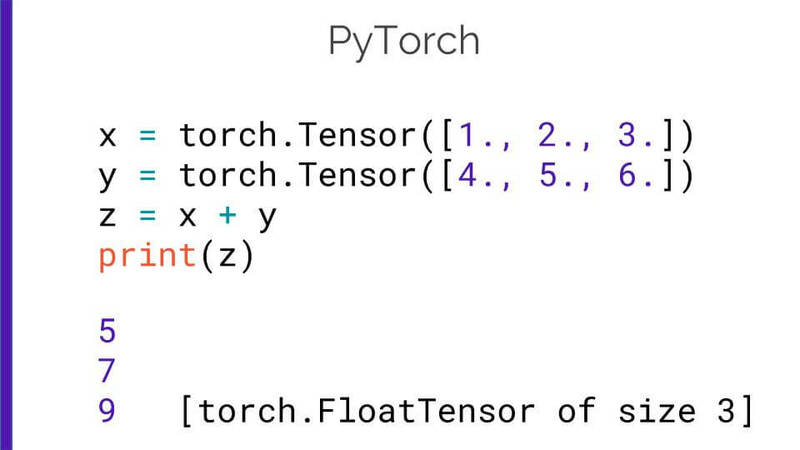 Because PyTorch is a define-by-run framework (defining the graph in forward pass versus a define-then-run framework like Tensorflow), your backprop is defined by how your code is run, and that every single iteration can be different. 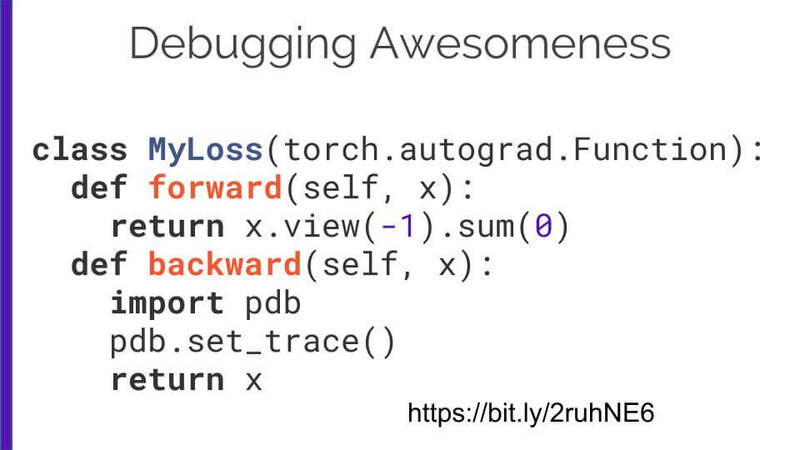 PyTorch records the values as they happen in your code to build the dynamic graph as the code is run, as you can see in the slide above from PyTorch's about page. 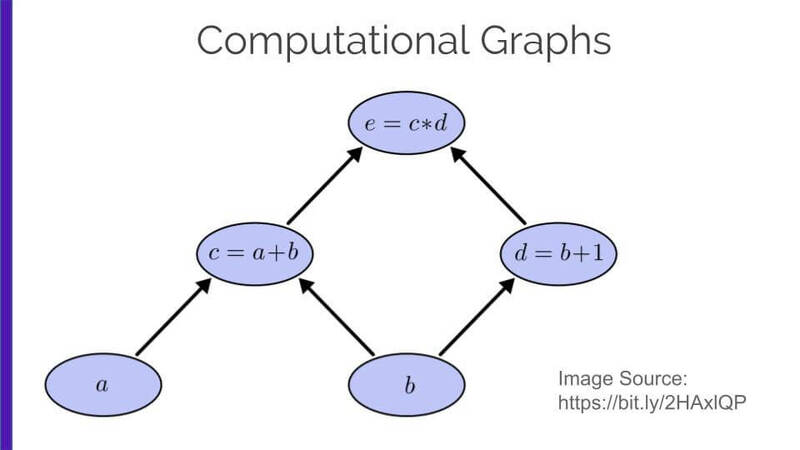 Now that we've gone through what dynamic computational graphs are, let's go through what makes them awesome. 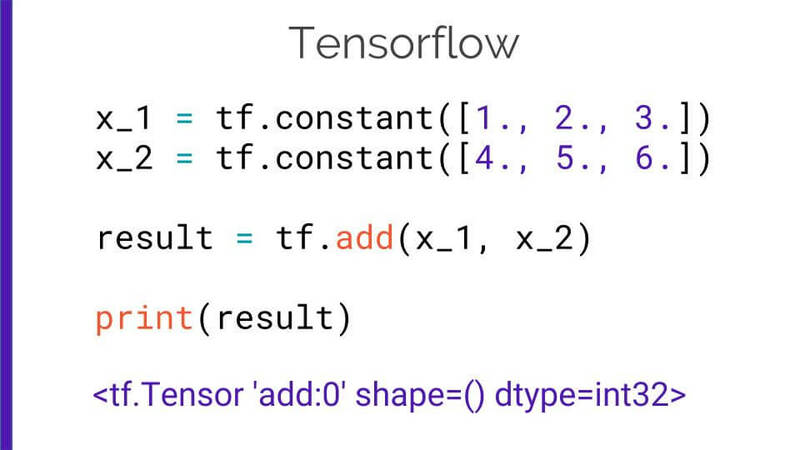 With Tensorflow, if you were creating an RNN, you would have to pad the inputs with zeros after setting the maximum length of your sentences to allow for varying input lengths unless you use Tensorflow Fold that allows for use of dynamic batching. 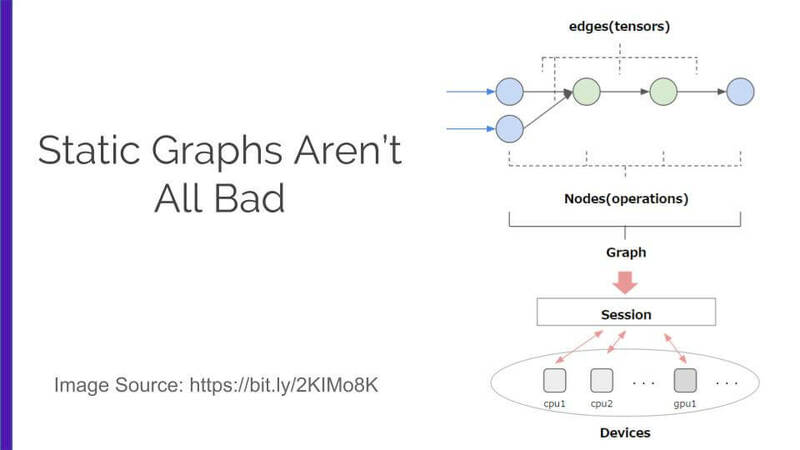 This is due to the static graph only allowing the same input size and shape because remember, the graph is defined before it's run so you have to explicit about your inputs before you create a TF session to run your graph. Now, static graph architecture also allows for the graph to be saved with all its methods and functions for production. 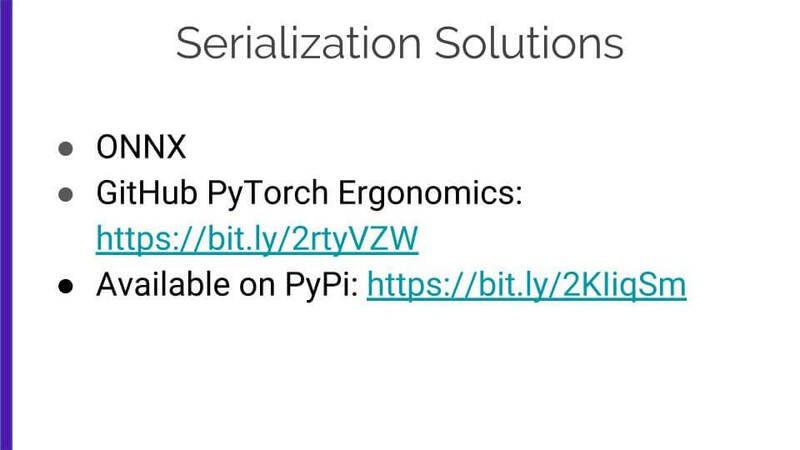 I’ll compare this type of serialization with PyTorch's a bit later on. 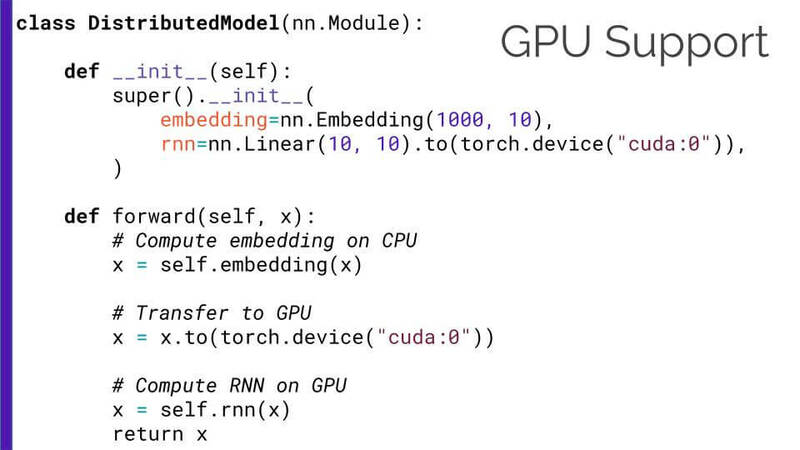 In PyTorch, GPU utilization is pretty much in the hands of the developer in the sense that you must define whether you are using CPUs or GPUs, which you can see with a quick example on the slide. You’re saying "hey, if I’ve got GPUs use ‘em, if not, use the CPUs." 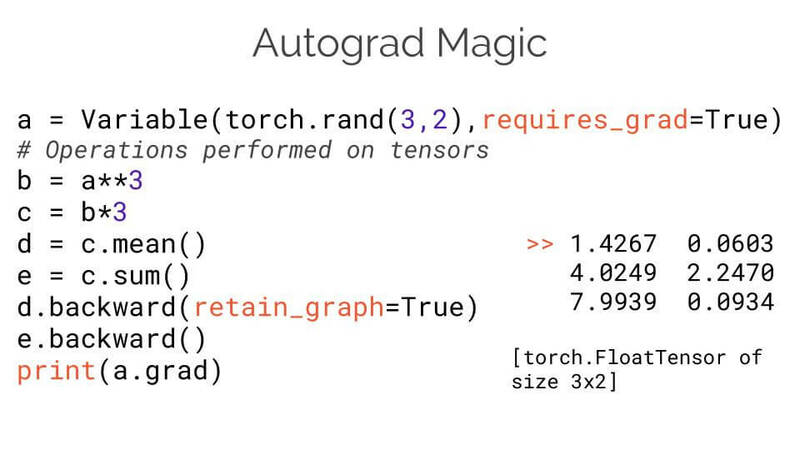 A note on GPU utilization In Tensorflow - while you can explicitly define whether you want to use CPUs or GPUs, Tensorflow tries to figure it out for you. If GPUs are available, it will defer to using them and will also take all available GPU memory. While training, a lot of times you want all GPU’s to be used, however Tensoflow (unless you use their pre-loading package) will take all available GPU memory for pre-loading and pre-caching data and I’m sure that’s not what you want to use your GPUs for. 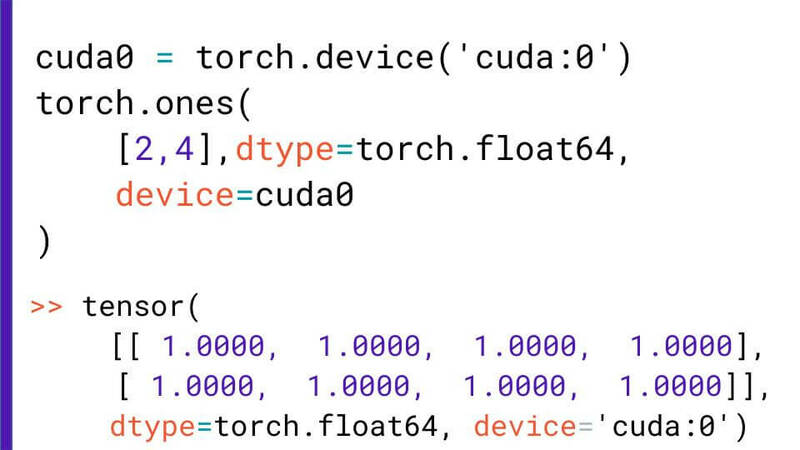 Another cool part about PyTorch and GPU utilization is that you can move everything from the content tree including tensors, gradient position, and weights - basically every component in the network - and it can be transferred back and forth from CPU to GPU. 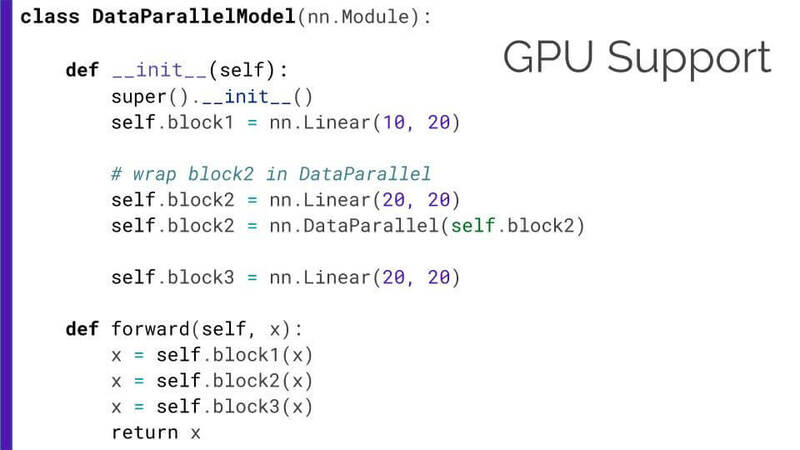 You can see on the slide how easy it is to transfer a tensor from CPU to GPU in the forward function...not hard at all! For custom, complex architectures - some work should be done on the CPU, and some on the GPU. Being able to optimize is really cool. However, CUDA copies can be costly, so be careful where you take advantage of this features. 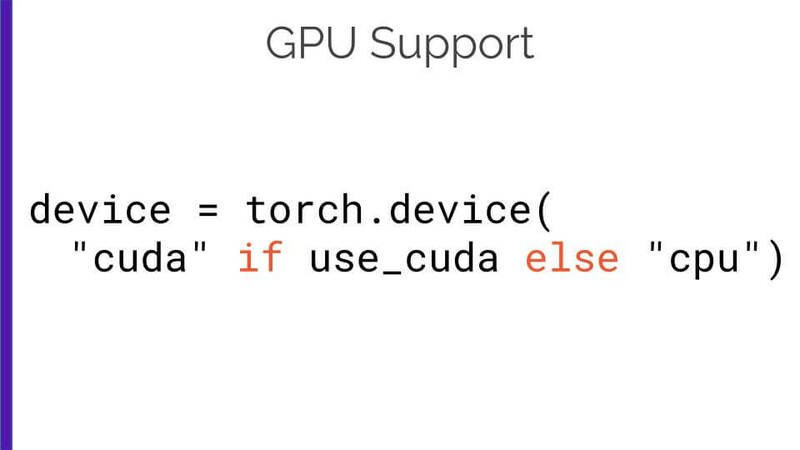 Also note that GPU operations are asynchronous so when moving stuff around you’ll want to use torch.cuda.synchronize() to wait for all kernels in streams to finish otherwise it will be very slow to move things around if they're waiting for the model to finish. 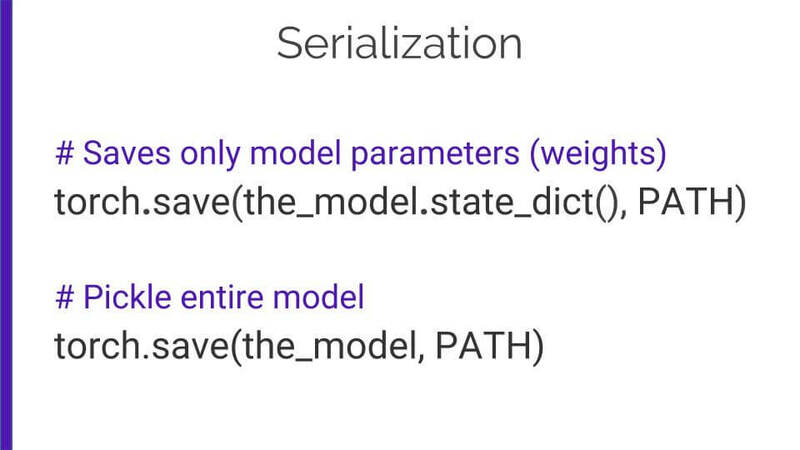 PyTorch’s methods for serialization and deserialization make backwards compatibility an issue in production - you have to be very careful about making changes to your model because if you don’t have the original source code you could have mismatched model parameters with your new model.